Home / baseball / Buffalo / Buffalo Bisons / CM / Daily Update / MiLB / Sports / Family 4-Packs still available for all remaining Bisons home games! Family 4-Packs still available for all remaining Bisons home games! BUFFALO, N.Y. -- There may be only seven home games left in the 2018 season, but that still gives Bisons fans seven great chances to take advantage of one of the best deals at the ballpark! 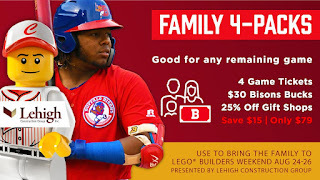 Mystery Ball Night, the final Honda fridaynightbash!®, LEGO Builders Weekend, presented by the Lehigh Construction Group and the Aesthetic Associates Fan Appreciation Night…the Bisons Family 4-Pack is good for them all. The Bisons final homestand of 2018 runs from Tuesday, August 21 through the 27 with one great event after another. So, before the summer comes to a close, bring the family back down to the ballpark for one last unforgettable experience. The Bisons Family 4-Pack is your best way to bring everyone to the ballpark and also save money. For only $79, you get four game tickets, $30 in Bisons Bucks that can be used anywhere in the ballpark (concessions, gift shops, Consumer's Pub at the Park) and 25% off at the Coca-Cola Field gift shops. That's a savings of at least 15%! CLICK HERE to get your Family 4-Pack today!